THIS IS THE 25TH AND FINAL ORNAMENT IN THE SIGNATURE SERIES. IT'S SUBJECT IS THE ICONIC INTERSECTION IN DOWNTOWN ERIE, 10TH AND STATE STREET. ANCHORED BY THE G. DANIEL BALDWIN BUILDING/RENAISSANCE CENTER, ERIEITES HAVE FOND RECOLLECTIONS OF DOWNTOWN SHOPPING, MR. PEANUT STROLLING ON STATE STREET, AND WAITING PATIENTLY FOR THE BUS ON ERIE'S WINDIEST CORNER. 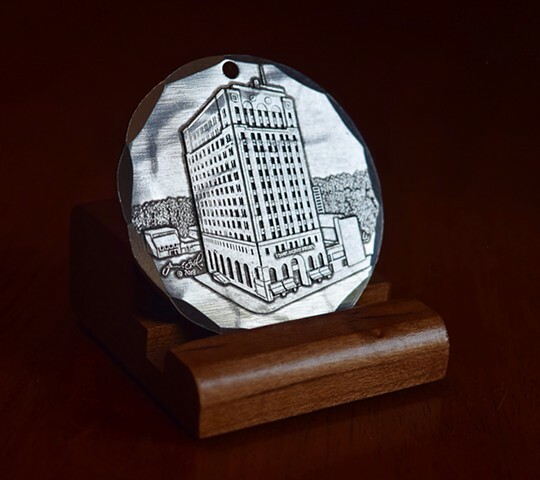 I CHOSE THIS IMAGE FOR THE LAST ORNAMENT IN THE SERIES BECAUSE IT EPITOMIZES THE HEART OF ERIE'S DOWNTOWN AND BRINGS US BACK TO THE SUBJECT OF THE SERIES, ERIE PA.